Here at Care Roadshows, our mission is simple: To provide healthcare professionals and care home owners with FREE healthcare seminars 2017 to inform, inspire and help improve their provision of care. Joining experts and other professionals within the sector will give you a chance to advance your skills and introduce you to new techniques which will benefit your residents. Make sure you register for your FREE tickets to our upcoming regional seminars today. Our 2017 healthcare seminars and workshops are designed to educate our delegates so that they can return to their care home residents with new ideas and enhanced confidence to provide an outstanding level of care. At our regional exhibitions, you will engage with a diverse range of care suppliers, industry experts and like-minded care professionals. You will also have the chance to discover innovative products specially designed to assist with challenging situations and help make residents more comfortable. The next of our healthcare seminars 2017 is set to take place in Cardiff. You will be given the opportunity to network and interact with industry leaders. Some of the seminars and workshops you can look forward to attending include, ‘Creative Reminiscence’ with a focus on The Power of Memory. This workshop, for example, aims to help residents reengage with their memories and build a sense of community with other residents through multi-sensory and creative sessions. You will also hear from Ed Watkinson, Director of Care Quality at Quality Compliance Systems Ltd while at the Cardiff 2017 healthcare seminar. Ed will discuss the importance of adapting to the leadership challenge and how to incorporate self-assessment into your daily working life. He will also provide examples on how the words ‘leadership’ and ‘management’ are synonymous and what is expected of you by the regulator. All of our healthcare seminars 2017 are FREE to attend and you will be entered into a £100 cash prize draw on the day. For more information about the logistics of the show and what you can expect from our Cardiff event, check out our most FAQs. You can also keep up to date with the latest information about our 2017 healthcare seminars by liking our Facebook page and following us on Twitter. 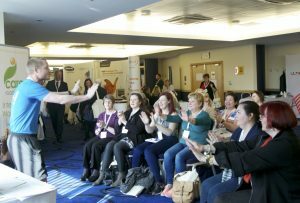 Here at Care Roadshows, we go above and beyond to provide the very best education for professionals within the care home sector. Owners, managers and care professionals will benefit from our healthcare seminars 2017 and we will inform them of how they can achieve a rate of ‘outstanding’ for their unmatched level of care. You will also be presented with a CPD certificate upon completion of a Certificate Request Form at one of our 2017 healthcare seminars. Finally, we are always on the lookout for inspiring and motivational guest speakers, so if you have innovative ideas which will benefit our delegates and the care we provide in the healthcare sector, please fill in this form to submit your proposal– we would love to hear from you! If you would like to improve your performance as a care home owner or healthcare professional and are committed to ensuring you provide the best care for your residents, register for one of our healthcare seminars 2017 today or call 01425 838393 for more information.